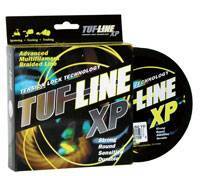 Aerospace technology has been utilised to produce TUF-Line XP fishing line. Braided under higher tension using Tension Lock Technology, to create more compaction of the fibres during the finishing process and a rounder profile than competitive lines. TUF-Line XPs state-of-the-art coating remains permanently bonded to the fibers, offering an incredibly long service life with zero shedding.